There are many reasons today to find the figure of the ʻMarxistʼ architectural historian Manfredo Tafuri a compelling one. Always critically and practically engaged in the world around him, even at the times when he appeared to be advocating a strategic withdrawal from it, Tafuri pursued an ideological criticism of the discipline and its relationship to the capitalist production of the city that changed the self-conception of the architectural institution and profession worldwide, in ways that have hardly begun to be worked through. He attracted to the architecture school in Venice, where he was professor from 1968, a number of brilliant young academics, including Francesco Dal Co, Michel de Michelis, and, perhaps most importantly, Massimo Cacciari (the philosopher who would later become mayor of Venice). At the same time, he was, for many years, a member of the Communist Party and related left-wing parties in Italy, integrating these activities into the development of the academy in ways that are almost inconceivable to us today. 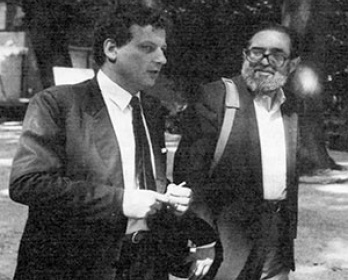 As an editor of the journal Contrapiano, whose contributors included Cacciari and de Michelis as well as Antonio Negri, he contributed to the emergence of some of the most important contemporary intellectual discourses. James Ackerman would hardly be alone in describing Tafuri as ʻprobably the most influential architectural historian of the later half of the twentieth century.ʼ Yet when the architect Aldo Rossi dedicated his image The Assassination of Architecture to Tafuri, it was never clear whether the assassin was imagined to be capitalism, or Tafuri himself. And whilst Tafuri always denied apocalyptic readings of his work, it seems that, since his untimely death in 1992 at the age of fifty-eight, the suspicions and anguish generated out of the ʻcrisisʼ he uncovered at (and as) the heart of modernity and architecture have never quite disappeared, but have simply been repressed and denied. In the anglophone world at least, this can be explained, in part, by the continuing lack of translations of much of his large output. So it was with much anticipation that I travelled to New York to bear witness to that rare beast, a conference on Tafuri called to welcome into existence that equally rare creature, a new and excellent translation of a significant work by Tafuri, in fact his last major piece of writing: Interpreting the Renaissance: Princes, Cities, Architects (Yale University Press, 2006; originally in Italian 1992). Tafuriʼs initial and most lasting impact came in the mid-1970s, following the translation into several languages of an essay originally published in Italian as ʻProgetto e utopieʼ. Written in 1969 for Contrapiano, the 1976 English book-length version, Architecture and Utopia: Design and Capitalist Development, with its at times clunky translation and cover image by Rossi, established Tafuriʼs reputation as the difficult-to-read prophet of the end of architecture. The work remains a stunning example of a Marxian dialectical analysis of the dynamics of metropolitan modernity and its critical and creative leading edge, as defined through the critical-historical concept of the ʻavant-gardeʼ. Form, plan and assemblage are amongst the concepts in the book whose dynamic, interpenetrating histories move productively between ideology and matter as they are taken on and developed by the competing yet interconnected logics of political utopianism and capitalist accumulation. 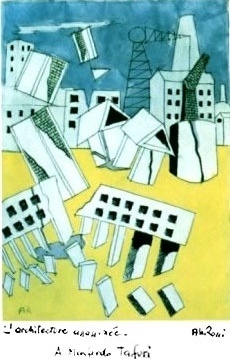 For Tafuri himself, the crisis described in Architecture and Utopia had been played out personally some years earlier in the decision ʻone tragic nightʼ to become an architectural historian, when he found it no longer possible to continue direct, operative engagement in the struggle over the production of contemporary urban solutions. Yet this personal trauma was itself no more than the manifestation of Tafuriʼs emerging understanding of the unresolved disciplinary trauma within architectural culture itself. Tafuri had set out the critical armature that would structure this work, and indeed that of the entire Venice school, in the 1968 book Teorie e storia dellʼarchittectura (the English translation of which did not appear until 1980). As several contributors to the conference argued, the different sequence of publications has been an important cause of confusion in Anglo-American architectural circles as to the trajectory of Tafuriʼs development. In this, his argument was for the necessity of a split between the practice of writing architectural history, and the practice and theorising of making buildings, because, as Andrew Leach set out in his paper: ʻarchitectural ideology, in the sense of values that determine or shore up architectural production, is inextricable from the representation of the past as historyʼ. Leach rightly emphasized the awareness of temporal orientation at work in Tafuriʼs position: the differences between knowledge of objects from the past and the way that this knowledge is used to determine the possibilities of the future. If architectural practice is paradigmatically orientated towards the future, then the status of architectural history entails a particular ʻdifficultyʼ that needs to be acknowledged. Daniel Sherer, the translator of Interpreting the Renaissance, also delivered a paper which sought to dispel the notion that there was any simple shift in Tafuriʼs work, from the position of a younger politically engaged activist to an older archival and remote philologist. As Sherer argued, modernity never ceased to be object of Tafuriʼs analysis. Indeed, consistently for Tafuri throughout his research (though not, perhaps until now, in his English translations), it was the Renaissanceʼs ideological relationship to antiquity that determines and acts as the ground of a later modernism. Perhaps the main question raised by this conference was how the contemporary and historical elaboration of the central concepts deployed in Tafuriʼs works (such as criticism, ideology and operativity) could be extended beyond the narrow understandings often promoted by that generation of ʻTafuriʼs childrenʼ most widely published in English. Such an activity is essential to any historicization of Tafuri today, and is crucial if we are to create new tools that can in some sense continue this project. Some useful contributions to such a project were made at the event, by Leach, de Michelis and Sherer, and also notably by Carla Keyvanian and Marco Biraghi. In rather different ways, there were some memorable scholarly contributions from Mark Rakatansky, Beatriz Colomina, Alessandra Ponte, Jean-Louis Cohen and James Ackerman as well. Almost entirely ignored by the event, however, were questions concerning Tafuriʼs reception in bodies of thought not entirely situated within architectural culture – a reception marked in Radical Philosophy by recent contributions from David Cunningham and Gail Day (see RP 133). This omission is not insignificant since a great deal of Tafuriʼs importance within architectural culture itself derives from the extent to which he was an emphatically trans-disciplinary thinker, so obviously influenced by Foucault, Benjamin and Althusserian Marxism – a historian who once audaciously attempted to form a fully transdisciplinary and transdepartmental critical history faculty at Venice, with a remit which stretched way beyond architecture. It is finally, perhaps, in this broadest sense, as a thinker prepared, whilst working with fragments, to think through social, political and cultural totalities, that we should continue to work through his legacies today. For although, as Mark Wigley (contemporary architectural cultureʼs own Wildean wit) could not help but point out, ʻa successful conference on Tafuri would be a disasterʼ, there was a real sense of urgency at the end of this event, persistently expressed in terms of the need to keep returning to his work. It was in this sense that a now-aging generation of theorists and critics – including Anthony Vidler, Kenneth Frampton, Diana Agrest and Joan Ockman – all concluded with the idea that it might be Tafuriʼs very indigestibility within consumer culture that keeps this project critical, as well as obscure. What they remained far less clear about was to what extent such a critical project remained their task, or that of contemporary architectural theory more generally, today.